Bearded Iris are one of my all time favorite flowers! Their tall standing stems crowned by delicate showy flowers are just stunning. 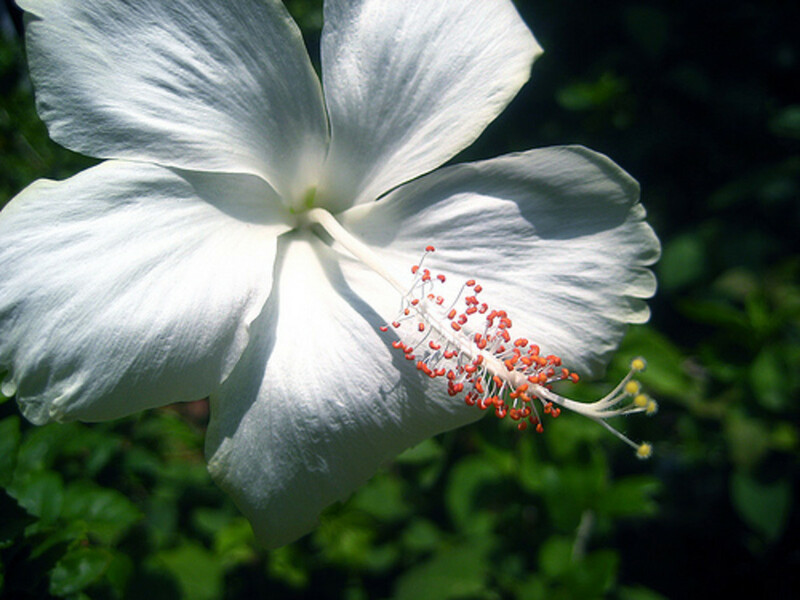 The flowers come in almost all colors and variations. They are early blooming flowers and their sword shaped leaves remain an accent in flower garden long after the blooms are gone. I would like to give you some information on the Iris flower, growing, facts and some history of one of my favorite perennial flowers. The iris flower is a genus of approximately 200 species of flowering plants with beautiful showy flowers. The iris has been around for centuries and gets it’s name for the Greek word for “rainbow”. This is based on the wide variety of colors found in the iris species. It is named after the Greek Goddess who is thought to be the messenger of love and used the rainbow to travel. The iris is also found in drawings on the walls of Egyptian palaces. It is also said the Moslems, took the iris to Spain in the 8th century and planted the flowers over the graves of their women to summon the goddess to guide the dead in their journey. In 1933, the Tennessee legislature designated the iris (the purple iris) as their state flower and the city of New Orleans is the Fleur-de-lis, or iris. The King of France selected bearded iris (iris germanica) as their emblem. The iris is naturally found in Asia, Europe, the Middle East, North America and north Africa. 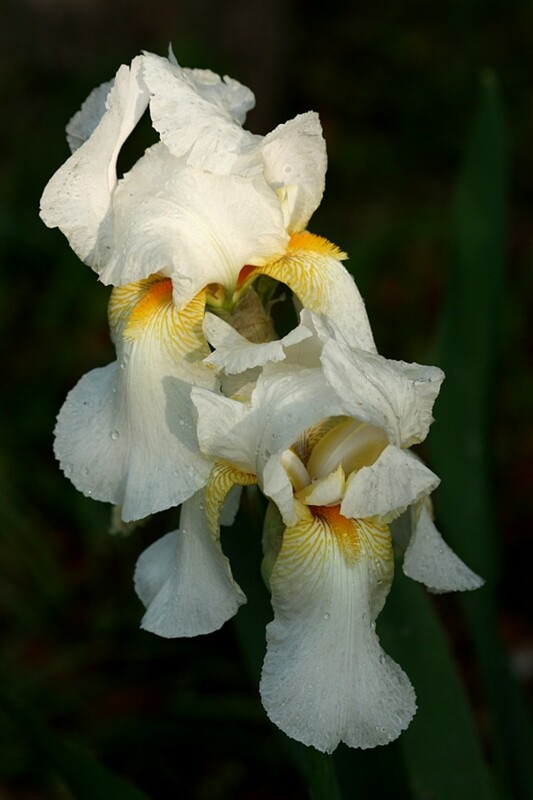 Irises are now being cultivated world-wide and there are many hybrids as they have become so popular. A common name for some species is “flags”. Iris comes in every color of the spectrum except true red. 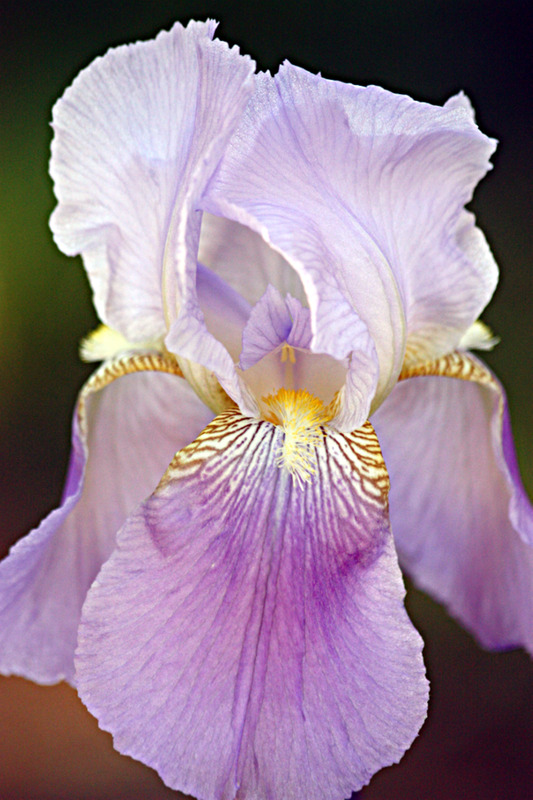 Based on their color, iris conveys varied messages. Blue iris is symbolic of faith and hope. Purple iris symbolizes wisdom and compliments, white iris means purity while yellow iris symbolizes passion. The dark blue or purple iris can denote royalty. 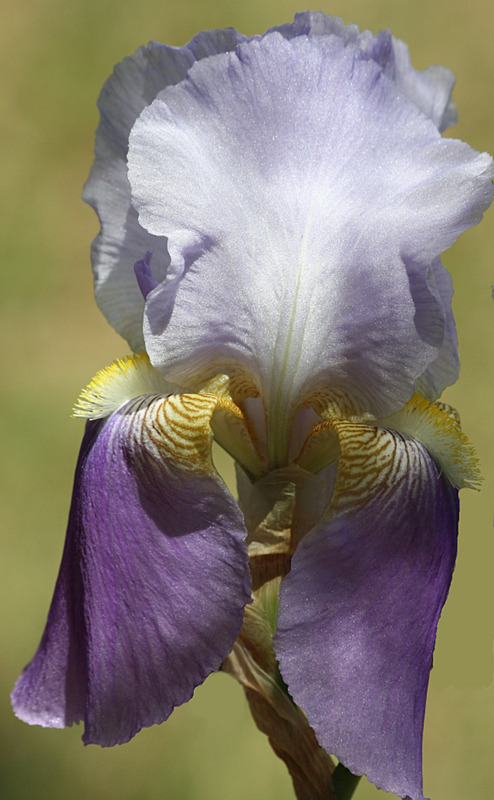 There are 2 major groups of irises, they are rhizomes and bulbous. Bulbous irises are normally smaller than rhizome irises and they require a dormant period in order to produce leaves and flowers as other plants that grow from bulbs. Rhizome irises grow from rhizomes or thick pieces of root that look similar to a potato. Siberian iris and bearded iris are the most common irises grown in the United States. Most iris in this category are “evergreen”, however they will go dormant only to return in early spring. By far the most commonly seen of the irises are the bearded iris. 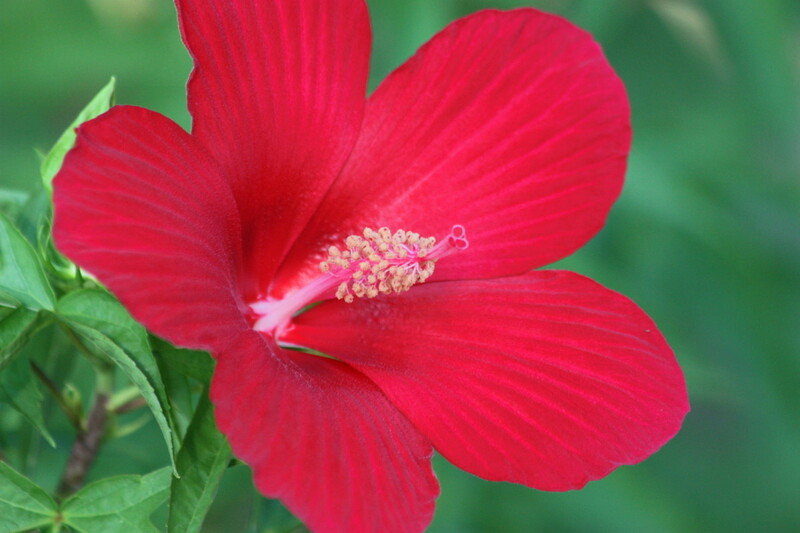 The blooms can be as large as 6 inches across and grow on sturdy stems which grow 8-10 inches tall. The leaves are sword shaped and can be an interesting specimen for your flower garden even after the plants have stopped blooming. The bearded iris has three sepals called “standard” which are upright petals and three “falls” which are the pendulous ones that have a spreading or downward droop. Bearded Iris refers to the bristly hairs that emerge from the throat of the flowers. They have a sweet perfume scent. Iris are one of the easiest perennials to grow and need little care. Whether your soil is clay, sandy, loam or rocky, you can grow iris. Iris like dry soil, not too much water and plenty of sun! The will grow in light shade but you will get much better results in full sun. The iris can take the summertime drought, which makes them easy to grow in many arid climates. The best time to plant your iris is in late summer or early fall. As iris are planted very shallow, you want to give the roots time to become well established before winter arrives. There isn't much to do to prepare your soil to grow iris. Whether your soil is clay, sand, loam or rocky, you can grown iris. Loosen you soil about two inches deep and place the rhizome on top of the loosed soil. Irises do best in soil that is slightly acidic, with a pH of about 6.8. If you soil is high in clay, you may want to add some gypsum to your soil to help break it up. Irises are one of the easies flowering plants to grow. I have just dropped a small plant while doing some transplanting, and it grew just laying on top of the ground. The most common mistake made by gardeners when planting iris is they plant them to deeply. They need to be planted very shallow. Take the rhizome and place it in the hole that you dug with the roots spread out and facing downward. Press down and mound the soil around it, just leaving the very top of the rhizome showing. Keep the plants approximately one to two feet apart for best blooming. Be sure the soil is well drained or the rhizome may rot. When planting new iris they need to be watered during the first season in order to get their root systems established. It's better to water deep and infrequent than shallow and often. Less is more for irises when it comes to watering established plants, and it's best to underwater than water too much. Once irises are established there they will need very little watering. Remember, over watering an iris can cause the rhizome to rot. 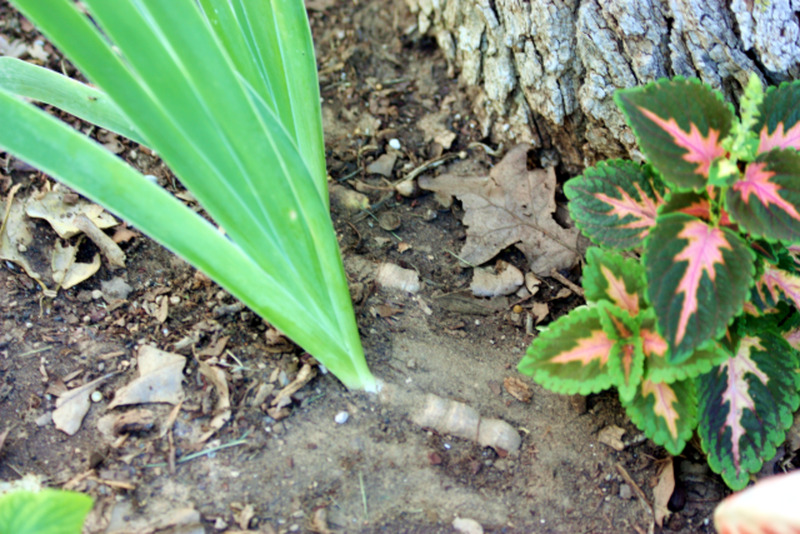 Your soil type will really determine which fertilizer will work best for your iris. As a general rule of thumb, a fertilizer with a low nitrogen content will work best, such as a 6-10-10. Bone meal is also a good idea. Apply any fertilizer lightly. Very early spring and early fall are the best times to fertilize. 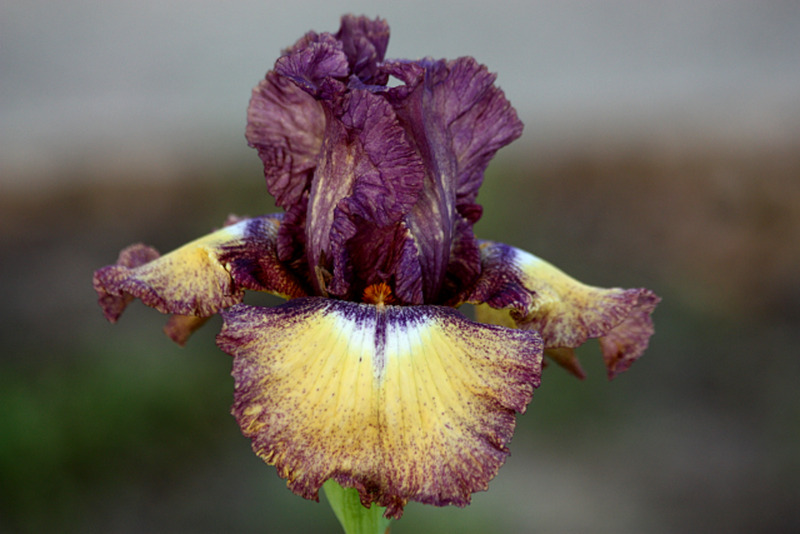 Once your Iris has finished blooming, it is time to remove the spent flower and flower stalk. Cut the dead bloom of just below the flower once it dies. I personally don’t remove the stalk until it starts turning brown. Be sure to remove any leaves that have turned brown as well. Every three or four years, your iris will need to be divided. If they get too crowded the blooms will not perform at their best. Crowding also increases the odds of a disease infecting the flowers as well. To divide the plants, dig up the rhizome with as much of the roots as possible. You may find several “plants” growing from the one rhizome. In this case, just snap the rhizome apart. Now you can take the “new” plant and move it to another sunny place to add some beautiful color in spring, or share with a friend. Dividing should be done in late summer or early fall. You need to give the roots time to get well established before winter. You want to keep your iris bed clean. Remove any dead or dying leaves as well as other leaves that may end up in your flower bed. Dead leaves make a great habitat for bugs. The root borer is a common insect problem for irises. Keeping your flower bed clean doesn’t give them anyplace to hide. You don’t need to mulch your irises, except over winter, you don't want the rhizomes to freeze. Remember they like it dry and mulching can cause the rhizomes to rot. 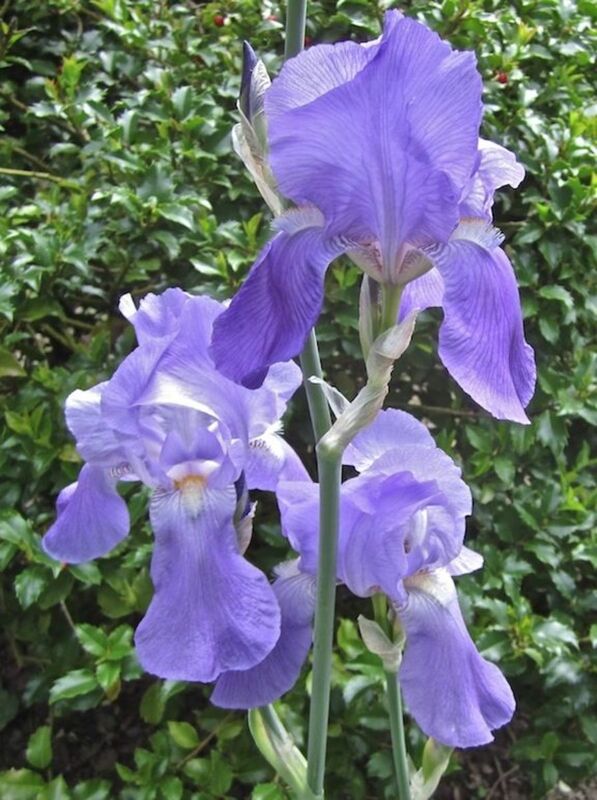 Irises are a beautiful specimen plant for any garden. When I divide mine, I will plant the extra plants in another location in my yard. I’m sure you can find plenty of sunny places to add these beautiful flowers and come spring you will have a glorious abundance of color with very little work. 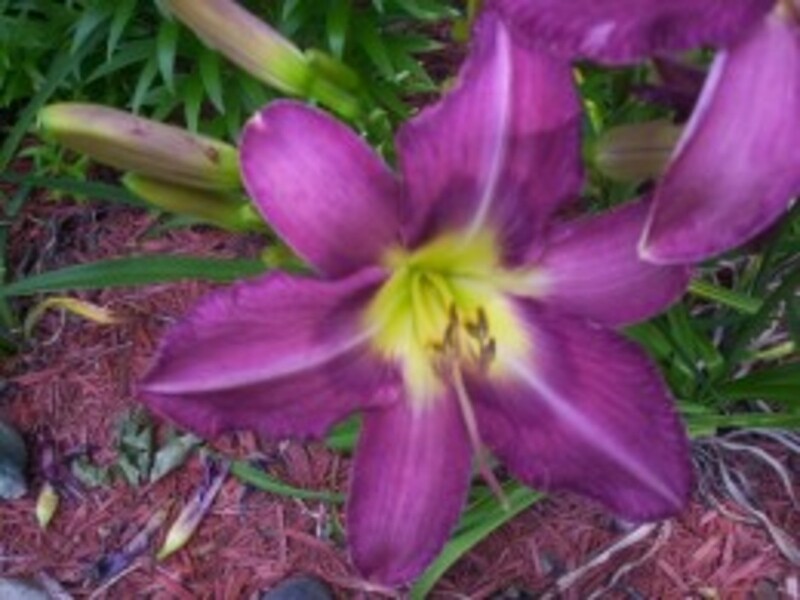 Purchase Iris Plants Now to Plant for Next Spring Beauty! Don't put off getting some iris for next year, planting iris now will give them plenty of time to establish a good root system for beautiful plants next spring. Really complete information and very helpful. Fun to learn about colors. I did not have a Pinterest account when I first commented and shared this hub. Going to pin this to my flowers board. Sheila, thanks so much. As I type, it is raining outside, and I am thinking about running out there in the dark to scrape the grass clippings off. I still have several iris in the yard. They need to be thinned out. I may place some of them under the Martin house this fall. Hi Sholland! Yes, I think your iris will come back. There are some planted on our pond dam, by the previous owner, and each year hubby mows them down after they have bloomed. They always come back. Just don't let the rhizomes get soggy due to the grass mulch. As long as the roots on the bottom of the rhizome are even slightly in the ground, they will be fine. That is so awesome that you have "generational" iris over 150 years old! Thank you for an very interesting and informative article on iris'. This is just beautiful. I don't plant them in my garden, but I certainly could now after your tutorial. Your iris photos are lovely. I do like the flower, not a favorite, but I certainly appreciate it more now after reading this. Thanks for sharing you knowledge with us. Hi Sheila. Beautiful hub. We have Iris all around our driveway. They are purple, not sure about the bearded part. Great info and tips. Voted up, shared and pinned. This is a great hub! I have what I call "generational" iris. They are bearded iris that my great- grandmother, grandmother and mother had. They have been growing in our yards for over 150 years. They are so easy to share. I did a stupid thing while mowing, though. My iris around my Martin house were finished blooming and the leaves were turning brown. I mowed them down, and it pulled many of the up. I was just sick (though I have many others in other areas of my yard). I went back and placed them each back in the ground - some were cut off at the root. I put some grass mulch from mowing over the top of them. Do you think they will come back? Iris is my favorite flower as you will see from my profile. Many of my hubs (especially poetry) feature a picture from my own garden. Thanks for the advice. Mine have not done great the past two years, but I cleared out a lot of matted leaves and put down a good dose of compost and I already have many buds. The first one opened today so what a great day to read this hub! Purple irises are most popular in my region. I loved growing the bearded irises when we lived in Wisconsin. What grows best in our "neck of the woods" is the Louisiana iris. 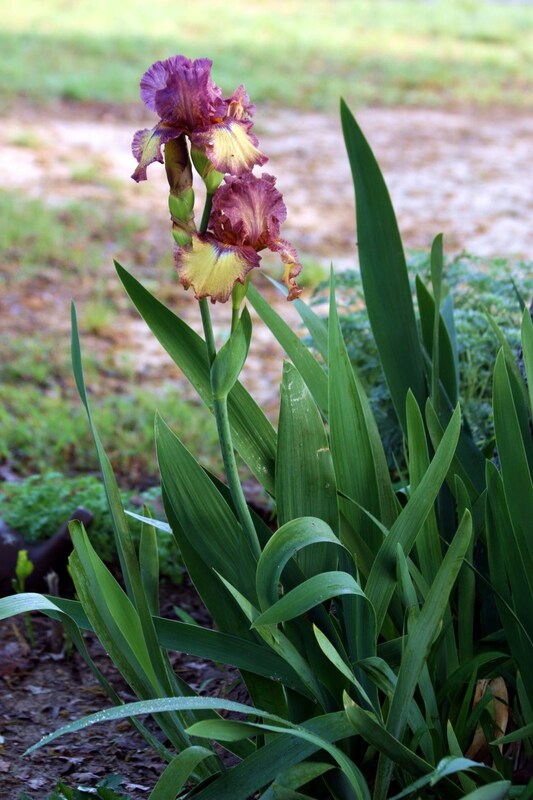 I added a link from this hub to the one I wrote about them titled Pictures of Beautiful Cut Louisiana Irises ~ Growing Irises... Voted up, beautiful, useful and interesting and will share. How did I miss this?? Flowers are one of my too many passions. My Momma used to have dozens of these in our yard so naturally they are one of my favorites. You of course shared a lot about these lovelies I did not know. Thanks for the tips so that I will be able to grow healthy lovely iris too. Hello Christy! Thank you for your kind comment. I hope you are able to have a garden soon, it's sounds like you would really enjoy it. Have a great day! What a pretty flower! You describe it well. I do not have a garden but live vicariously through everyone who does until I get one! Hello molometer. Thank you for your kind comment. The iris is one of my favorite flowers. Thank you for your votes and sharing. It is always appreciated! Have a wonderful day! Love these wonderful photos and your hub is very enlightening. I had no idea there were so many varieties. Voted up interesting and sharing. I love iris's so lovely and delicate. Some wonderful tips and advice here thank you. The Iris is such a Beautiful, yet delicate Flower. Wonderful tips on how to grow them successfully Sgbrown. It's tempting. Thanks for sharing! A beautiful hub Sheila, you know how much I love gardening and flowers yet I have never grown Iris! Thank you for the advice on planting and caring for the plants, you have inspired me to give them a go. Hello Pat! Iris are one of my favorites too! I'm glad you like my picture and my article. Thank yo for your kind comment! Have a wonderful day! IRIS IS ONE OF MY FAVORITE FLOWERS.EVEN FOR A PICTURE I WILL PICK AN IRIS ONE. SO NICE TO SHARE AND EXCHANGE WITH FRIENDS.ENJOY Shela's STIFLES ON FLOWERS. Enjoyed reading this one - I love iris and your pictures are beautiful. I have several myself but my favorite is a gigantic pink one that usuaslly blooms around Mother's Day. It was early this year!